Hydraulic fracturing, also known as fracking, induces micro-seismic events by design. Human activities such as mining, geothermal energy extraction, building hydro dams and oil and gas operations can affect local geological stresses and thus cause micro earthquakes called induced seismicity. 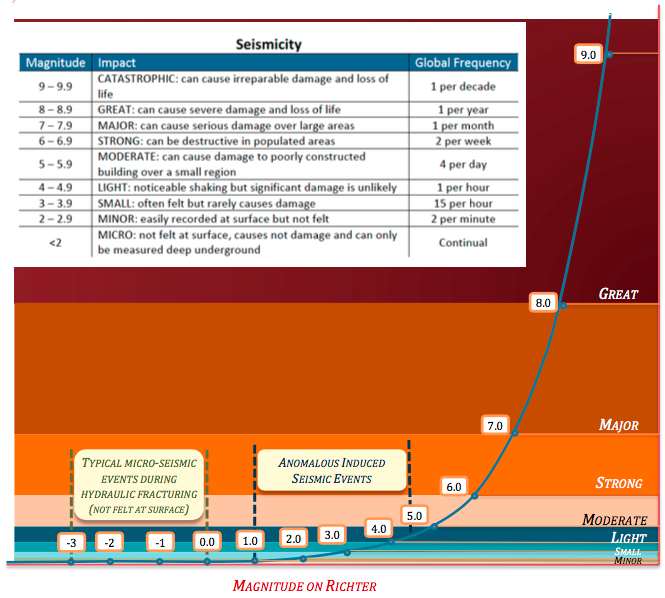 Induced seismicity events are normally low magnitude on the Richter scale (-2 average) and are not new phenomena. This level of micro-seismicity occurs naturally as well, thousands of times each day all over the world, with no consequence, and are not reported. Companies involved in the fracking process use extensive scientific research and world-class technology to create very small cracks in tight rock formations deep underground to establish pathways for natural gas or oil to enter the wellbore and be brought to surface. Slight vibrations, or micro-seismic events, are emitted during the fracking process. Wastewater disposal is another known cause of induced seismicity related to oil and gas activities. Regulators provide strict oversight of disposal wells to ensure wellbore and disposal rock unit integrity, safe operation and containment of disposal fluids. Limiting injection rates to control formation pressure or ceasing disposal can mitigate induced seismicity related to wastewater disposal. For a comparison of induced seismicity due to wastewater disposal and fracking see the Investigation of Observed Seismicity in the Montney Basin report. There have been cases where fracking has generated minor to light seismic events ranging from magnitude 1 to 4 on the Richter scale. They are called anomalous induced seismic events because they are unusual or inconsistent with what is expected. Seismic activity in the magnitude 3 to 4 range may cause detectable vibrations, similar to those felt when a heavy truck is driving by, but the event is unlikely to cause damage. The industry, Natural Resources Canada (NRCan) and provincial regulators take anomalous seismic events seriously and their prevention is a major focus of research by Canadian academics. Ongoing studies help to identify geological areas prone to seismicity so the oil and gas industry can take precautionary measures. According to Alberta and British Columbia regulators and researchers, none of the unintended events to date have caused damage at surface. In the past ten years, regulators, governments, industry and academia have increased their understanding, monitoring and management of induced seismicity associated with fracking. Though the issue is still perceived as controversial by the public, the practice of fracking is a highly-regulated, safe and proven production technique. 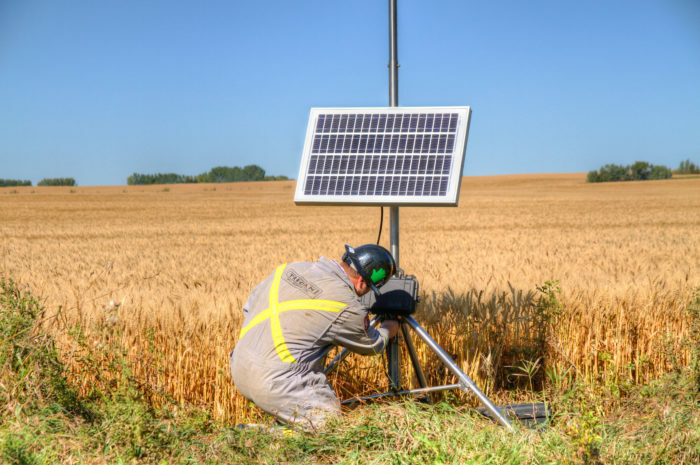 Regional seismograph arrays have been installed in Alberta and British Columbia where fracking programs are ongoing, to monitor seismic events in more detail. Natural Resources Canada and provincial regulators oversee the monitoring systems. There is a growing body of Canadian research into the relationship between fracking and induced seismicity. Oil and gas operators are contributing by sharing their experiences and knowledge on induced seismicity risk appraisal and mitigation, and their approaches to research. The ultimate success of reducing the risk of induced seismicity in oil and gas operations rests with collaborative relationships and dialogue among frac companies, oil and gas operators, regulators, the research community and the public. The Canadian Induced Seismicity Collaboration and Induced Seismicity Monitoring Network Consortium are collaborative projects focused on improving understanding and responses to anomalous induced seismicity. The majority of induced seismicity associated with fracking can be felt at the surface. The vast majority of induced seismic events associated with fracking are “micro-seismic” because they can only be detected with highly sensitive instruments. They are not felt at the surface and cause no damage to infrastructure.